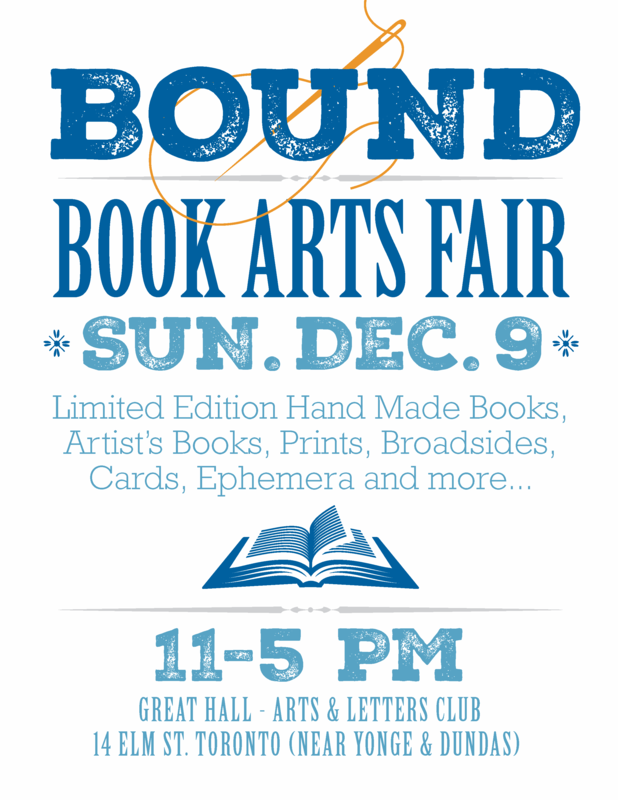 BOUND Book Arts Fair next weekend in Toronto! How time flies, 2018 is almost over! Next Sunday, December 9th 2018, we’ll be at the BOUND Book Arts Fair, held at the Arts & Letters Club, 14 Elm Street in downtown Toronto. That’s just two short blocks north of the intersection of Yonge & Dundas, so if you’re taking the TTC subway, you want the Dundas station on line 1. It looks like there will be almost 40 vendors there, selling prints, cards, handmade books, printed ephemera, and other things print-related. Space is tight for vendors and we’ll be focusing on our handmade and marbled papers, although we might have other things (such as bookbinding materials) not immediately on display, so when you see us, ask for what you’re looking for! The show runs from 11am to 5pm, and admission is free.